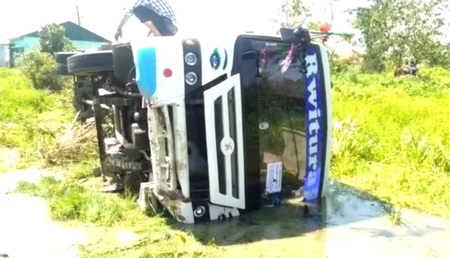 NAMSAI, Apr 12: Polling officials and police personnel returning from the Wagun, Nongtaw Khampti and Wingseng Nangtaw polling stations under the Namsai assembly constituency sustained minor injuries late Thursday night when the bus they were travelling in spun out of control and overturned onto a ditch beside the road. The incident occurred at around 1 am when the passengers were returning after completing their election duties. The electronic voting machines (EVM) in the bus were also reportedly damaged. A police team rushed to the spot and took the injured to the hospital, from where they were discharged after being given first aid. Namsai SP Ankit Singh said rash driving was the cause of the accident. He said the driver lost control of the speeding vehicle and jumped out of it seconds before it fell into the ditch. “We have arrested the driver and a case of negligent driving has been registered,” Singh said. The SP further said the EVMs have been taken into custody and sent to the state election office. “Right now, we cannot say if the EVMs suffered damages because only experts can tell after thorough examination of the machines. We can give a definite answer only after the EVMs reach the state election office and are examined properly,” the SP said.